Infgraphics was originally published at Money Pod. Women are still under-represented in the UK in terms of entrepreneurship and business. Although the gap between the number of male and female entrepreneurs may be closing, it still exists. 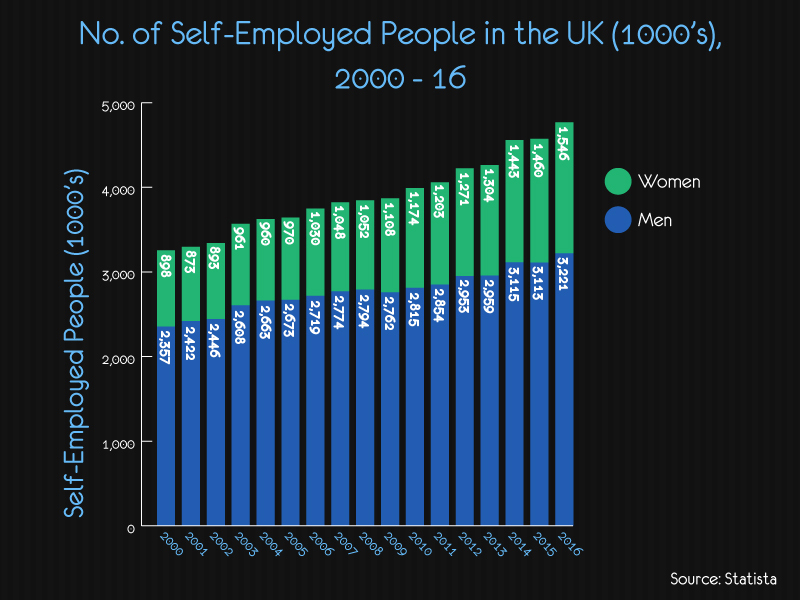 In the UK the so called “Enterprise Gap”, the difference in the number of men and women owning companies, has significantly decreased in the last decade, but there is still work to be done. There are 5.5m SMEs (small to medium-sized enterprises) operating in the UK today, with only 20% led by women – that’s 1.14m in total. The UK has not only seen an increase in female entrepreneurs in recent years, but also in women occupying directorial roles. 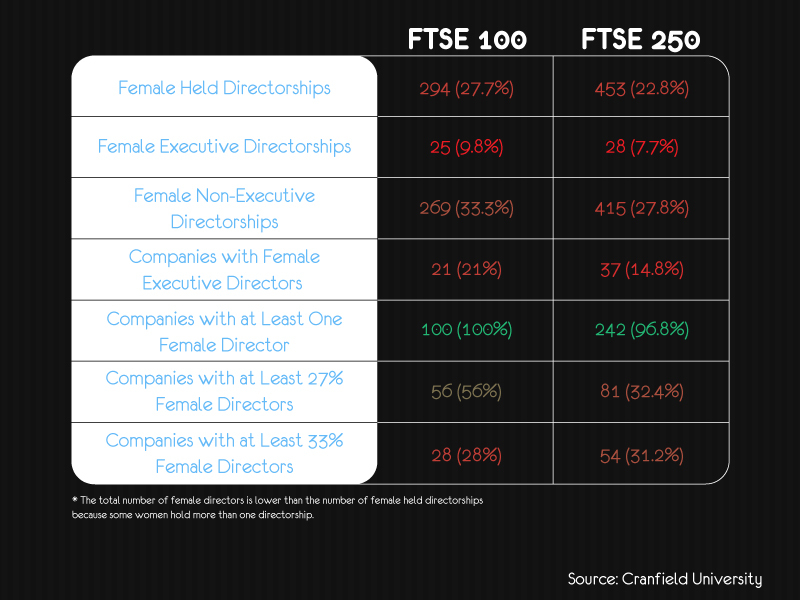 In 2017, 28% of FTSE 100 directorships were occupied by women. This exceeds a target set in a 2011 governmental report that said there should be a minimum of 25% female representation on boards. 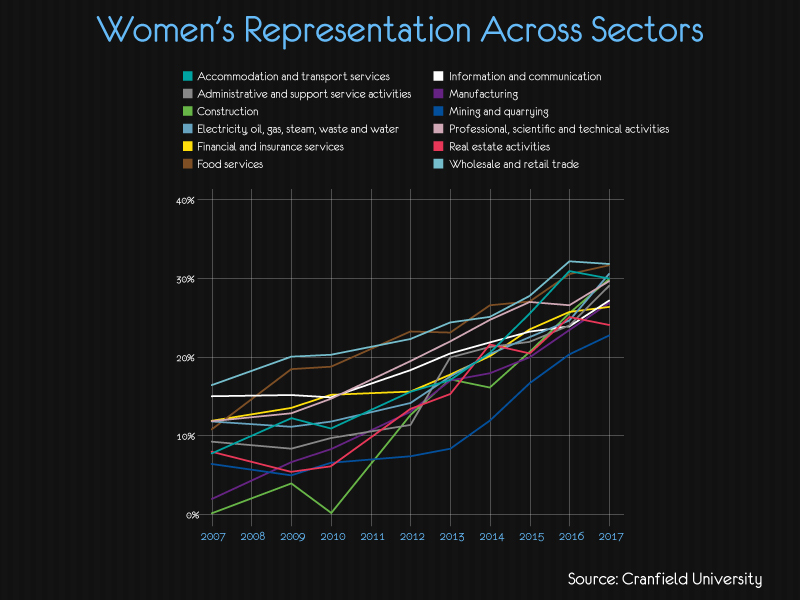 Looking at the differences across sectors of women representation on the boards of FSTE 100 companies, there has been substantial changes in the past 10 years. In 2007, there was no women on the boards of companies in the construction sector, and only 4% in manufacturing. Both sectors or now operating at or above the government’s target of 25%, with representation of 29% and 25%. 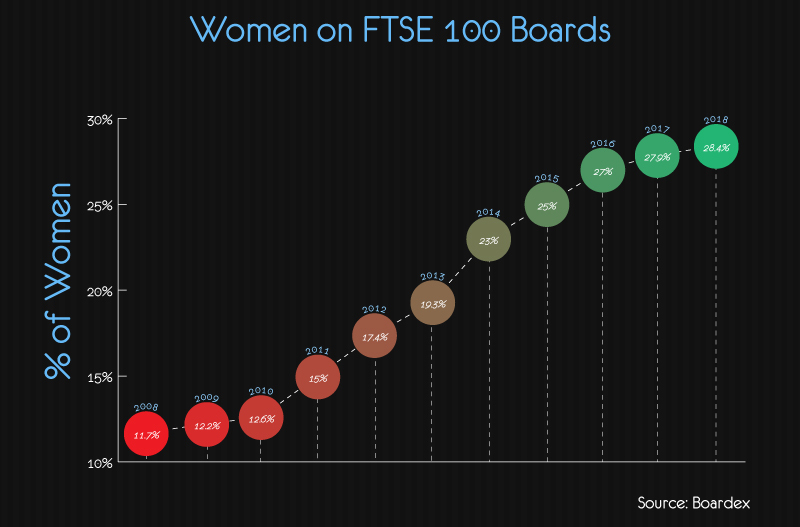 There are now 0 all-male boards in the FTSE 100, down from 21 in 2011. In fact, 46 companies have now reached 30% representation of women in the boardroom. The trend is also being matched in the FTSE 250, in which 62 companies as of October 2017 had reached 30% representation of women, and only 9 all-male boards remain, down from 131 in 2010. Overall, there is a significant variation by region when it comes to the percentage of women who are directors in businesses. Wales and the North of England are the most gender-equal parts of the UK, at least in terms of having a low share of businesses with no female representation on boards and high rates of having more than one. Not only has female directorship considerably increased, but more women are starting their own business. There were 648,000 more businesses owned by women in 2016 than in 2000. That’s a significant 72% increase in 16 years. During the same time, male self-employment also increased, from 2.357m businesses in 2000, to 3.221m businesses in 2016. London and the South East are the leading hubs of female start-ups, with female entrepreneurs generating an extra 18,000 jobs in the Capital in 2015. This meant that there was an increased economic contribution of £790m from female led start-ups in London alone. 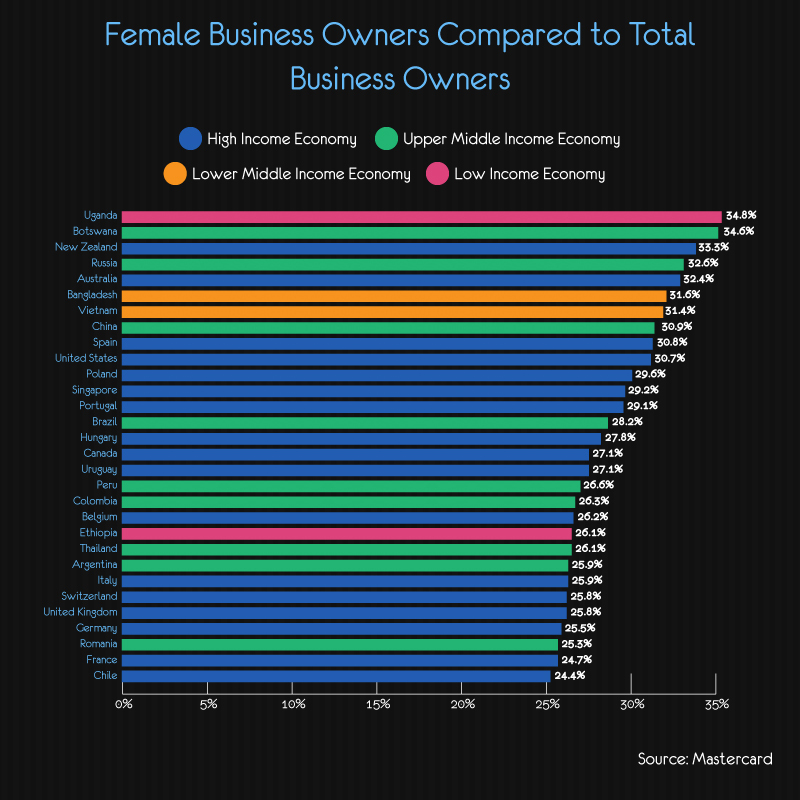 The percentage of women business owners compared to total business ownership changes drastically from country to country. Women business ownership is not always correlated to the wealth and level of development of an economy. In the UK, 25.8% of total business owners are women.